And, finally, if you were awake for that end of the post, you might remember me observing that writing about places – travel writing, for want of a better word – needs its corsets off to be really, truly liberating. And the last seven days have been armchair travelling to surpass all expectations. Not just because MTM – architect and partner of author Andra Watkins, with whose blog MTM’s wonders have been shared – has, true to form, chosen places which surprise and delight. But rather, because the prism through which he sees is tinted by passion for his art, and a communicator’s zeal, and sometimes pure, well-grounded infatuation. We learnt about a new kind of duel: the battle for the horizon, and the John Hancock Center which basks in its fishnet stockings on Chicago’s skyline. Already, the corsets were off. And we met ethereal Dawn, naked in a pool in Barcelona, surrounded by the minimalist lines of the exquisite Barcelona Pavilion. The assault on the skies, the cathedral they took risk after risk to build ever higher, Beauvais, was followed by the Vernesque Parisian library, the Bibliothèque Sainte-Geneviève, which is covered in the names of history’s greatest thinkers and held up by pillars of iron. MTM glanced affably back at the gaggle of cybertourists following before holding up an umbrella (guides do that here, do they do that there?) 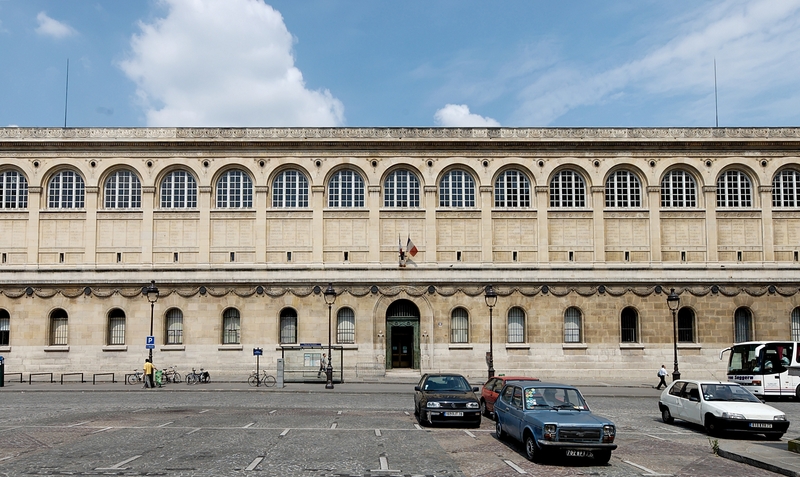 and plunging towards the comfortable purpose-built sophistication of the Maison De Verre and its beautiful library. And so, nodding to some of the great gardens and their use of stone we arrived to gawp at the timelines of the National Museum of Roman Art in Merida, Spain, a seemingly effortless marriage of Roman and Modern architecture across the ages. And finally, like all great guides, MTM ended with a flourish at the great dome of the Pantheon. For those of us who have been here for the whole ride: it’s been a blast. To MTM, and to Andra, who have both shared so generously: thank you is not a big enough expression. And now, if you’ll excuse me, I’m off to liaise with the travel agents. Posted in MTM's Seven Wonders, Places to visitTagged architecture, MTMs seven wonders, Seven wondersBookmark the permalink. It was indeed a grand trip; one I could never have afforded under any other circumstances! Thanks, Kate, for your bright idea and to MTM for the tour! It’s been fun to tag along, hasn’t it, Karen? It was a tour de force of a series – funny, erudite, and surprising, frankly. Thank you for challenging your friend, and congratulations to MTM. All Side View’s fault, Wanderlust: she set the seven wonders challenge 🙂 It has been a wonderful week. I did nothing but get out of his way. 🙂 I’m glad the series came together. I expect a surge in the budgeted allotment for “Travel” by many of Andra’s and your readers. Me most of all, Nancy! It was all quiet lovely, mysteries unfolding, old structures given new life, and a second or third look. It was. Thanks for coming along, Judy. Thank you all, including Sidey who inadvertently started it. But especially thanks to MTM, Andra and Kate for the whole trip. You have a gift for these things, Sidey. Glad you came along, Elspeth. It has been great, hasn’t it Sidey? Take that corset off and explore! This was a fun and inspiring ride Kate! Thank you for thinking this up and thanks to MTM for expertly crafting it. I have to say “Sorry”, Kate, for giving an answer to MTM’s question that was tosh. I shall now think about it, and then get it wrong.